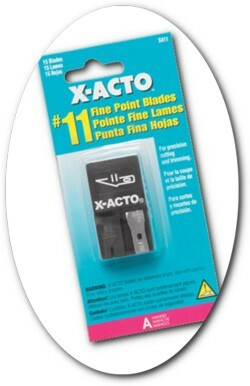 X-Acto Knife Blades, No. 11 Blade With Safety Dispenser. Change blades frequently for safer and more accurate cutting. Steel blades are ground to a surgical edge for precision cutting. No. 11 blades fit No. 1 (x3201) X-Acto knives. Non-refillable dispenser pack of fifteen (15) blades.